You can charge your device using any Samsung-approved wall charger, but charging speeds may vary depending on the charger. Use the charger that originally came with your device, or use only Samsung-approved charging devices and batteries. Samsung accessories are designed to maximize battery life. Using other accessories may invalidate your warranty and may cause damage. Your device is powered by a standard rechargeable Li-ion battery. A two-piece wall charger (charging head and USB cable) is included with the device. The battery comes partially charged. A fully discharged battery requires up to 4 hours of charge time (in standard condition, using a Samsung wall charger). You can use the device while charging. DO NOT use any other device charger. If you need to use and charge the device at the same time, you must use the Samsung wall charger that came with your device. 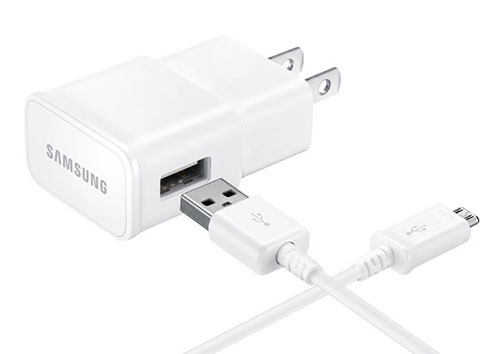 The Samsung wall charger is required in order to properly charge your device. Using a third-party charger can hinder the charging of your device and may cause battery issues if used long term. The picture below is the charger for your device. This charger is 5.0V/2.0A and has SAMSUNG printed on it. If you don't have access to the factory wall charger, you can charge the device using the USB connection on your PC, but the device will require twice as much time to charge. • Connect and charge the device using the factory wall charger for 1 hour. The battery charging indicator may take up to 10 minutes to appear on the device's screen. • Disconnect the device and then attempt to turn it on by holding the power button down for 15–20 seconds. The Samsung logo will appear. • If the device turns on, the device needed to be charged. Turn off the device and reconnect it to the factory wall charger for an additional 6 hours. • If the device fails to turn on, your device needs service. Please complete a Service Request.